It is no coincidence that Barcelona has been part of the UNESCO Creative Cities Network as a City of Literature since 2015. It is a collective that brings together a hundred cities that stand out in areas such as music, film, gastronomy, digital arts, crafts and, of course, books. 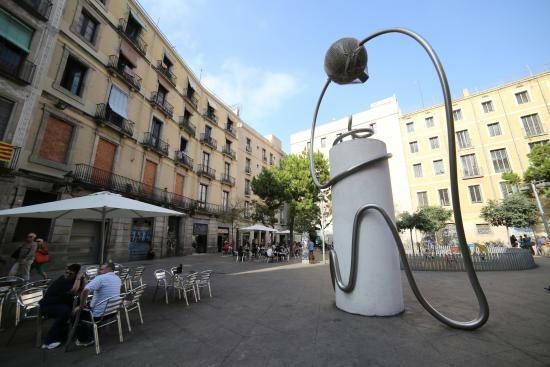 In this sense, few places are so linked to black on white as the Catalan capital, not only for having inspired some of the best works of universal literature, but also for being a pole of attraction for the most notable bookworms. If you are an avid reader, we are sure that you will love to immerse yourself in the literary tour of Barcelona during your next getaway. A unique experience that you can easily enjoy staying in our Barcelona apartments near the beach. To quench your thirst, we have compiled some books inspired by Barcelona that will make you walk its streets and avenues even more eagerly (and, why not, that will put you in the mindset of a knight-errant, of a shrewd detective or a medieval merchant). Pay attention! We open our list with an autobiographical novel set in the underworld of Barcelona. In fact, the Parisian Jean Genet wrote it during his stay in prison and after having landed in Barcelona in the convulsive thirties. At that time, Genet, the son of a prostitute and juvenile delinquent, decided to settle in the old V district or Chinatown (the current Raval), where he entered a universe that he would end up immortalizing in The Thief’s Journal (Journal du voleur). In its pages, bars, cabarets, theaters, brothels and other establishments converge and wove the DNA of the most rogue-like Barcelona. Do you dare to discover it? We remain in the 1930s, since these years have left us with another of the jewels that cannot be missing in any bookshelf. This is Homage to Catalonia, a first-person account of the Spanish Civil War. Its author, the British Eric Arthur Blair —better known as George Orwell—, recounts his arrival in Barcelona in 1936 and his participation in the struggle as a private and official soldier between December 1936 and June 1937. 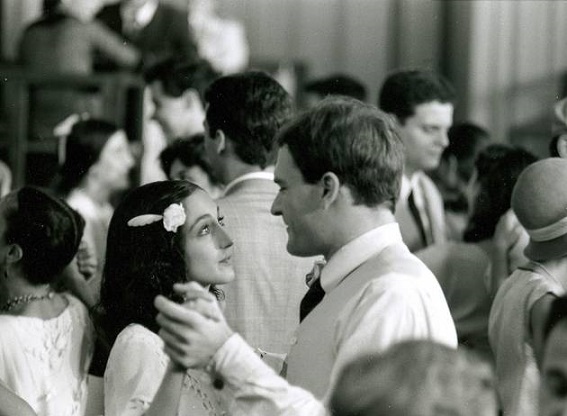 On that date, the party in which he militated, POUM, forced Orwell to flee to avoid prison. Today, a square in the Gothic quarter (in the image) pays tribute to his work. In the postwar period, a very young 23-year-old writer amazed the public and the critics with Nada, a stark portrait of the Barcelona of the time. The main character of the novel is Andrea, a teenager who moves to Barcelona to start her studies and a new life just after the Civil War. In addition to being worthy of some of the most prestigious national awards, such as the Nadal prize or the Fastenrath prize, Nada was taken to the cinema in 1947, becoming one of the many movies filmed in Barcelona. Translated into more than 40 languages, The Time of the Doves (La plaça del Diamant in Catalan, also translated as The Pigeon Girl or In Diamond Square), is one of the heavyweights of Catalan literature. Focused on the Republic and the Civil War, it tells the story of Natàlia, the unforgettable woman nicknamed Colometa, who must face a period full of uncertainty and face the trance of a loveless marriage. Although this is the most celebrated work by the Barcelona novelist, Rodoreda also has other titles that take place in Barcelona, such as Aloma (1937). In the case that concerns us, the chosen scenario is the iconic Gràcia neighborhood. In addition, it was also the subject of a film adaptation starring Sílvia Munt. Awarded with the Biblioteca Breve novel prize in 1965, this absorbing novel delves into bourgeois Barcelona through the friendship between a university student with a good family and a motorcycle thief who pretends to be a revolutionary worker. Its author, one of the last survivors of the Generation of 50’ and winner of the Cervantes Prize in 2008, is one of the most acclaimed voices of Barcelona literature. The Francoist dictatorship is the backdrop to this ambitious narrative, that earned its writer the Planeta prize in 1975. Considered by many to be the best work by Barcelona writer Mercedes Salisachs, The Gangrene is the chronicle of a wealthy and powerful family, but also of the more affluent neighborhoods of the Catalan capital, where the author was raised. The most famous adventure of detective Pepe Carvalho —winner of the Planeta prize, and which many include among the best novels in Castilian of the 20th century— is the post-Franco Barcelona, on the eve of the first municipal elections after the death of Francisco Franco. The action starts with the brutal murder of an influential businessman who was supposed to travel to the Southern Seas and sees the rise of one of the most memorable detective novels of the ill-fated Barcelona novelist. 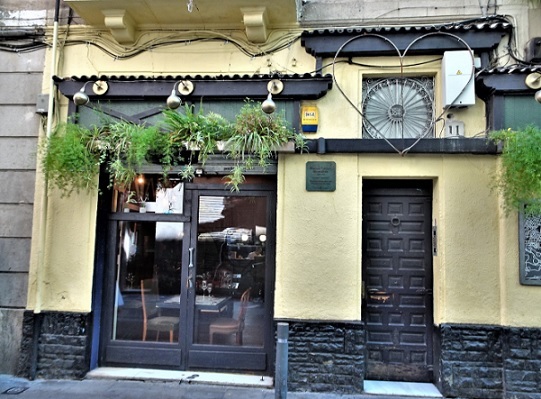 By the way: if you want to see the house where he was born, you will find it in the Raval, in the Calle de la Botella, 11 (in the photo). This delicious novel, the first of four that make up the tetralogy of The Cemetery of Forgotten Books, needs no introduction. The numbers are jaw-dropping: it has been translated into more than 50 languages and has more than 100 editions and has sold more than 14 million copies. This is the presentation card of the adventures of the young Daniel Sempere, the son of a self-sacrificing bookseller, and of a constellation of characters that lead the reader through the most evocative scenes of Francoist Barcelona. Another of the great best-sellers of recent Spanish literature. 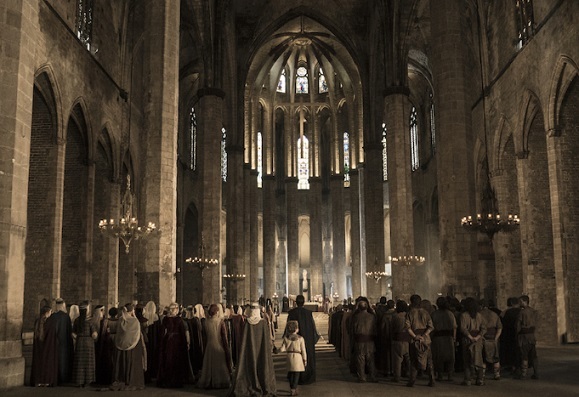 With more than 6 million books sold, it is the chronicle of the construction of what is probably the most beautiful church in Barcelona: The Basilica of Santa María del Mar, one of the most admired medieval buildings in Barcelona. A television series inspired by the novel was recently released too. We left the quintessential book for the very end of this literary tour of Barcelona. 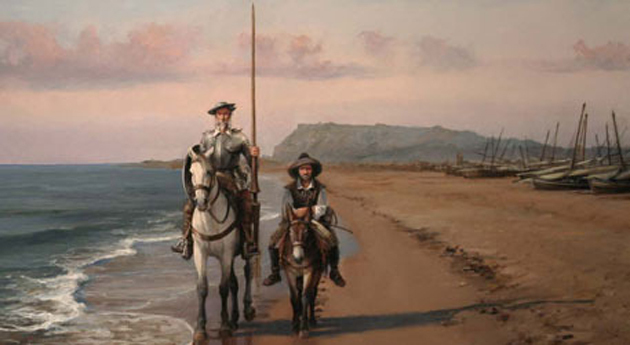 We are talking about, without a shadow of a doubt, of the most translated novel in history: Don Quixote. Besides being the only great city that is mentioned in Cervantes’ masterpiece, this city has a determining role in the plot. Without going any further, it is on the beach of Barcelona where the famous knight falls defeated against the knight of the White Moon, which pushes him to end his journey through Spain and return to La Mancha. Also, what is known that Cervantes was in fact in Barcelona, where he visited a printing press, and that the city left an excellent impression on him. Although we have finished with this literary tour of Barcelona, we could not forget to mention acclaimed works such as Private Life (1932), by Josep Maria de Sagarra; Un señor de Barcelona (1966), by Josep Pla; The City of the Prodigies (1986), by Eduardo Mendoza; The Kiss of Peter Pan (1993), by Terenci Moix, The Timeless City (2007), by Francisco González Ledesma (who signed the text as Enrique Moriel)… These titles and many more can easily be found on the shelves of bookstores from Barcelona. It is even fair to mention that the poet Antonio Machado briefly lived in the city— at the Majestic hotel, on Passeig de Gràcia, and at the Castanyer Tower, on the Paseo de Sant Gervasi, 5-13— before going into exile in France, or that it has been visited by the unrepeatable Federico García Lorca, who represented part of his theatrical repertoire next to Las Ramblas; Nobel prizes of the likes of Ernest Hemingway, Gabriel García Márquez or Mario Vargas Llosa … Pretty impressive, right? Do you know any other novel set in Barcelona? If so, do not hesitate to send us your literary recommendations. We will be happy to read them!